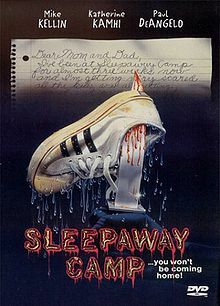 Nearly a quarter of a century ago, movie fans gasped in collective horror while wishing our summer fun was anywhere NEAR as scandalous as the ending to 1983's iconic classic Sleepaway Camp. And still the memories from the beloved but confusing cult classic ending are enough to continue to inspire nightmares. 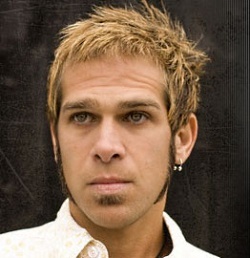 Ricky, played with boyish aplomb by Jonathan Tiersten, was the befuddled cousin of Angela and a fan favorite for years to come. Jonathan has been rather busy in the years since camp and was kind enough to talk with us about his acting career, his music career, and more. Hello, thanks for taking the time to speak to us! I knew you mainly as an actor but the more research I did about you, the more I realized that music appears to be just as important if not more central in your life right now than acting. If you had to choose one or the other, which way to you think you would go? Oh, if I had to choose? Wow, I've got to be honest, it would be music. It's just that I always tell people, I love acting and I studied it in college but I didn't pick music, it picked me. I can't imagine my life without it. You have the new EP, which is called We'll See. I got a folksy rock-type feel off of it but then I listened to another track of yours called "In The Air," which ended up being the theme song for the horror flick The Perfect House, which you also act in. It didn't even seem like it was the same style of music. How did that come about and what was the song inspired by? It was really inspired by the fact that the director and writer Kris Hulbert asked me to write a song for the film. We put it on the EP even though it's not necessarily matching the rest of the genre. I wrote it with my cousin, Peter Kuperschmid, who's a phenomenal songwriter in his own right, and it was funny because we were never actually in the same location when we wrote the song. I was filming another movie called Redemption and he was in Long Island and I was in upstate New York and we were collaborating via the phone. I did the recording up in the mountains in upstate and did the vocal tracks there and Peter did all the other tracks in his house and we came up with that. As far as it not sounding a whole lot like the other songs, I've sort of been all over the map throughout my career. I sang lead vocals in bunch of Black Sabbath, AC/DC cover bands. You were also part of the Magic Box in and around NYC? Man, yeah, that was an interesting time. It was during that whole roots rock scene in Manhattan and I was very good friends with a guy named Jono Manson who had become sort of an iconic figure in that scene, even though he lives in Santa Fe now. He just recently toured with John Popper and Jono was the first guitar player in the Spin Doctors and Joan Osbourne played at the same bar I played at first. I played once a week for a year. That was just part of that whole scene. Chris Whitley, may he rest in peace. Some wonderful amazing artists that came out of that whole thing. I wouldn't say that my music stylistically was as roots rock back then as it is now. You are a NYC NJ guy, I grew up 30 minutes north of NYC. What would make you up and leave all the NYC bright lights and take off for Fort Collins, Colorado? That is some change of pace. I call it the anti-culture shock. Truth be told, there were so many bizarre reasons. A bad love affair, very much disenchanted at that point in my life with how the acting business was despite the fact that I was getting all these A-list auditions, I don't even think I understood what was going on. Here I was reading for the movie Teachers and the only people they were talking about were me and Ralph Macchio. Or when I got down to the final call with Weird Science. It's funny because I actually went out with Anthony Michael Hall last year and I said, "I actually got down to that last audition and I never got a call back" and he goes (in low hiss voice), "There’s still hope." In real life, he's a lot like that character. He's a close talker, you know. Oh my god! That’s going to be in print. Oh well. I can cut that out if you want me to. You can put it in there. I don't care. He can take a joke. Honestly, I was twenty-five years old and I wasn't ready and I left [NY] . There were probably several years after that where I sort of looked back and went, "What an idiot," you know? Or it could be considered a nice change of pace at the right time? Colorado is paradise and even when I first moved out here I would still fly back for auditions every now and again. That sort of faded into the backround, so there were about ten lost years there. But to be able to come back to it after all the things I've been through, it's been great because I feel like I'm centered now and I'm ready for this. Who knew Sleepaway Camp was going to reach such cult status? It's got more than cult status. Besides having one of the most shocking twist endings in the history of horror films, it got a sequel! You reprised your role as Ricky Baker in Return To Sleepaway Camp. How did you feel about revisiting this character after knowing the movie had attained such a lofty place in horror fans' hearts? It's funny because we filmed that movie long before it came out and I was fairly disinterested. I hate to admit that. I had a wonderful experience because I got to spend time with Felissa [Rose] again. We've been so close for a number of years, but I was not in the greatest emotional place at that time, so it was a little difficult. That's why when I came back and did The Perfect House. I really hope we end up doing Sleepaway Camp Reunion and I've talked to Felissa and I’ve talked to the Sleepaway Camp producers several times and I think it will happen. Because now I would like to do something with the Ricky character. He was a hero of sorts. He was the protagonist of the first one. The thing about Sleepaway Camp that always boggles my mind is that even after the horrendous shocking twist ending, people love Angela. And I don't mean they love her because she's a freak, they love her because she's lovable! She is a lovable freak! The character was a topic of conversation for months afterward in my world. With Eli Roth coming out recently and saying it's on his Top Five list, I was like, "Oh my God." That zany Eli Roth, you should work with him! I would love to. I'm so excited because The Perfect House is going to come out next month and I finally got to see the first clips of my character John Dosey, who's a serial killer. There's no spoiler there. We know what he is from the onset. In The Perfect House and Redemption, the characters you play are decidedly darker. Yeah, I'm a pimp in Redemption! You know they're dark but then again, they're not. I purposely didn't play them dark. They do have hobbies that are a little on the dark side, no? Exactly, but there's no question that both characters have a certain panache and are kind of funny and sort of make light of these incredibly tense situations which was how I was trying to play it. I was happy when I saw the clips because it read that way. It was so much fun to really delve back into the craft of acting because that is what I went to college for at NYU. In fact, it opened me up as a songwriter, so one feeds the other. That's why when you asked me to choose I was like "Do I have to?" It's like do you want to be deaf or blind, and I'd rather be blind. It's not even a question. You are producing Good Ol' Boy aren’t you? Yeah, it’s exciting. We've got Andy Summers of The Police writing the score. Let me stop you dead right there because I've got to tell you that I have had a fanatical devotion to The Police and all its members since nine years of age. When I read that on IMDb, I nearly fell off my chair. Have you had any dealings with him yet? Not yet, but I can't wait. You know, it's like when other people talk about Hollywood stars but to meet Andy Summers I'm like, my jaw is going to be on the ground. I'm a little jealous right now. Yeah the opportunity is just amazing (loud noise in the backround). I hope it's not too noisy in here because I'm at the hair salon, believe it or not. This is what you call impromptu. This is my best girl Kristin who is cutting my hair, so it's very exciting. When you’ve got a 4 1/2 year old, you basically squeeze everything into a little tiny niche during the day and then you blink and it's time to go to bed. My manager and my publicist are like, "You are going to be so insanely busy when you leave for the East Coast at the end of the month," but I was kinda like, "You've got no idea." As a parent of a four year old, I would imagine the trip would be somewhat of a break. You are touring with Ten Tiers correct? I’m looking at the tour dates and you are going to be playing in Fort Collins but you are also going to play Maxwell's in Hoboken and The Stone Pony in Asbury Park, which is legendary. Any feelings about appearing on that stage because let's face it, it's played host to some serious rock royalty? Obviously it's an honor to play there, but there's also the weird one degree of separation because when I was doing Return To Sleepaway Camp, Vinny Pastore was in it and it was funny because Vinny wasn't really giving me the time of day during the whole shoot. I was there for like five weeks, and then all of a sudden somebody slipped him one of my demo CDs and then I couldn't get rid of him. He's like a huge music guy. He was a DJ back in the 80s, so he took my CD and went down to NYC and hung out with Little Steven [Van Zandt] for the day. He said, "All we did was listen to your music and Little Steven talked about how you reminded him of Bruce," and this and that and the other thing, so I'm trying to see if someone can get word to Vinny so if he's around the area, he'll come to The Stone Pony. How cool would it be if Steve Van Zandt came as well? They've been known to show up and you're a Jersey boy. Are you going to extend this tour beyond these dates or is this a limited time engagement? It's a limited time engagement because I have pressing things when I get back to Colorado because there's Starfest in Denver which is always a huge deal and that's where they are going to do one of the screenings for The Perfect House. Then I'm going to finish that up and I'm probably going to fly back to Philly because we are talking about doing some screenings on the East Coast that are going to be coupled with live performances. I’ll bounce around that way and I think the next mini tour will be in either June or July in Los Angeles. My website will have those updates. The actual release of the CD is March 25th but they can go to jonathantiersten.bandcamp.com and there is stuff you can already download there. Time for The CB 3! Thriller or Purple Rain? I like them both a lot. I’ve got to go with Thriller. Don’t they both have Anthony Michael hall? No, just 16 Candles, I’m pretty sure. OK then, 16 Candles. Maybe that will make up for my previous comment. Consider yourself redeemed. Do you prefer Debbie Gibson or Tiffany? Can I abstain from answering that? Do you know that you are the second guy who has asked me if they could skip that one? One guy knew them both and I suspect the other dated them. I’ll give you a weird snippet that's a stranger scenario than that. When I came to do Return To Sleepaway Camp, the first thing I heard was Chad Ginsberg pop out of a van when I was sitting in the office and he was like "JT! We lived with the same girl!" I had never met this guy before in my life and thought to myself, "What are the odds?" It was the first thing he said. That sounds like a good way to break the ice. You've got something in common. Very weird, so we've been friends ever since. Thanks for talking with us today. Good luck with the tour and the EP and I certainly hope your hair turns out well!